The English Cocker Spaniel is a loving, gentle-mannered, devoted, loyal, happy, lively and playful dog whose goal in life is to spend every minute he possibly can with you. He will stick close by your side, shower you with kisses, and wag his tail madly when he sees you. He likes to lie on the sofa with you or share your bed, yet he's also a moderately energetic dog who is ready to play and who craves outdoor exercise and activity. He can be left alone for short periods, but is not a dog who can be kenneled. He needs human companionship, and bonds very closely to his family, and quite often to one person in particular. He's extremely devoted and affectionate and tries hard to please and understand you. A trainable dog who is willing to work and to respectfully obey you, he can also be somewhat sensitive, and so requires gentle training with no harsh corrections. Although he is sweet and gentle he is also determined, confident, athletic and hardy: an independent dog who can hunt in all weathers. He makes an excellent bird-dog and retriever. He needs daily walks and hikes and chances to play fetch and other games. He does very well at dog sports like agility and tracking, and he makes a wonderful therapy dog. He is full of life, friendly and outgoing, and generally gets along very well with strangers. He is considerate to guests, and only occasionally reserved with them. He makes a fairly good watchdog as he is moderately protective, somewhat barky, and ready to sound the alarm at strange sounds or approaches. But he is likely to lick and welcome a burglar as soon as he comes in the house! He gets along very well with other dogs and pets he has been properly introduced to, and he is excellent with responsible children. He is good and playful with them, but does not tolerate teasing well. He is a medium shedder, and so might not be a good pet if you are concerned about dog-hair in the home. The English Cocker Spaniel is 14 to 17 inches tall (to shoulders) and weighs 26 to 34 pounds. He has a double coat consisting of a long, silky outer coat and a soft, thick undercoat. His coat color can be solid or multi-colored, and can contain black, tan, white, blue, brown, gold, red or orange. He needs a 10 to 15 minute brushing a couple of times a week to keep his coat free of tangles. The English Cocker Spaniel is descended from the spaniel dogs of Spain, who prior to the 17th century were all grouped together as a single class of dog. 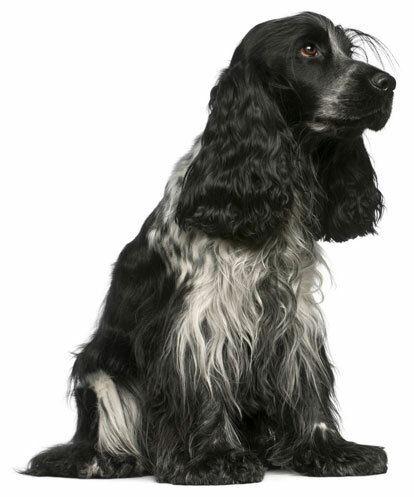 During the late 19th century Cocker and Springer spaniels were separated and bred according to their different sizes and abilities. The Cocker became known as an excellent hunting dog, his name derived from a bird he was often called on to flush, the woodcock. In 1935 the English Kennel Club further separated the English Cocker Spaniel from the smaller American Cocker Spaniel, and The English was recognized by the AKC in 1946. His AKC popularity was 69th out of 157 breeds in 2007.